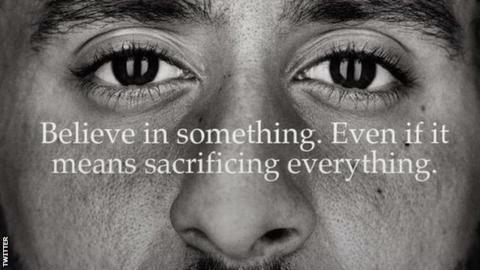 Critics have burned Nike trainers and clothing in protest at Colin Kaepernick's appointment as the face of the brand's new advertising campaign. The American football quarterback, 30, protested against racial injustice and police brutality by kneeling during the US national anthem. But opponents took to social media, promising to destroy Nike products. On Twitter, they hit out at the deal using the hashtag #JustBurnIt - a play on Nike's slogan "Just Do It" - which trended on Twitter alongside #BoycottNike. In an interview with the Daily Caller, President Donald Trump, who has been strongly critical of the protest movement Kaepernick sparked, said: "I think as far as sending a message, I think it's a terrible message and a message that shouldn't be sent." A statement added: "The social justice issues that Colin and other professional athletes have raised deserve our attention and action." Meanwhile, Andrew H Scott, the mayor of Kentucky city Coal Run, said he was "officially done" with Nike and the NFL and asked Nike to cancel an order, while several videos showed Nike trainers being burned. Country singer John Rich tweeted a photo of a pair of Nike socks with the brand's swoosh logo cut off. However, another Twitter user Teri Shockey countered: "To everyone who is planning to #JustBurnIt, might I suggest you donate your @Nike merch instead? Plenty of people in need, including vets and families of active duty military, would be more than grateful to wear it. #JustDoIt"
Kaepernick, who has received Amnesty International's highest honour, has been without a team since he opted out of his contract with the 49ers in March 2017. "Colin Kaepernick drew our collective attention to the problem of continued racial injustice in America," said former CIA director John Brennan on Twitter. Nike is celebrating the 30th anniversary of its "Just Do It" slogan. Its new advertising campaign, also includes ads featuring tennis star Serena Williams, New York Giants wide receiver Odell Beckham Jr and Seattle Seahawks rookie linebacker Shaquem Griffin.